Located at the apex of Pacific Heights, the neo-classical penthouse of the 2000 WASHINGTON STREET cooperative apartment house enjoys world-renowned views of the San Francisco bay, the Golden Gate Bridge, Marin headlands and Alcatraz Island, along with the verdant greenery of beautiful Lafayette Park. The ever-changing colors of water, sky and cityscape provide a dramatic and inspiring vista from dawn to dusk. The two-level apartment has been virtually redesigned by prominent architect Andrew Skurman, and reflects the distinctive 18th Century English Palladian style which unites architecture and interior design in an aesthetic style of quiet luxury, balance and harmony. The apartment has been most thoughtfully and impeccably finished with every detail considered for the comforts of modern City living. It is at once a lively and elegant space for the enjoyment of host and guests, as well as a serene and quiet place high above the tempo of urban life. Secured elevator service to the 7th floor. The massive double arched doors provide a warm welcome to the apartment. The classic floor is set on the diagonal with black Belgian and French limestone square inlays. The Great Hall introduces a sense of proportion, symmetry and harmony found throughout the apartment. The space is punctuated with Doric columns. An ornate fireplace of white statuary marble is its focus, along with the sweeping staircase with an exquisite hand carved railing. The hand scraped Versailles parquet floors are made of quarter sawn white oak and finished in an antique patina. The walls are faux painted in a glaze of deep, rich cognac. Four Palladian style round arches provide a dramatic enfilade or progressive visual effect; the perspective meets a matching arched paned French door to the north balcony of the living room. Custom lighting for a fine picture gallery has been installed. 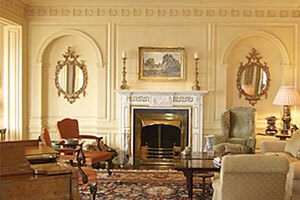 Neo-classical moldings are set at the cornice line of the arches with a lay light providing filtered natural light. The exquisite POWDER ROOM off the gallery is elaborately fauxed with hand stenciled chinoiserie. A hand painted bowl with gold plated Guerin faucets in a bamboo design are set in the bow-front vanity. The floor is intricately inlayed in French limestone and black Belgian marble. This handsome room with lovely park outlook is off the gallery and features a plaster fireplace, oak paneling custom cabinets, bookcases with stenciled leaf pattern in gold, and integral shutters. It is a perfect place for quietude or private meetings. 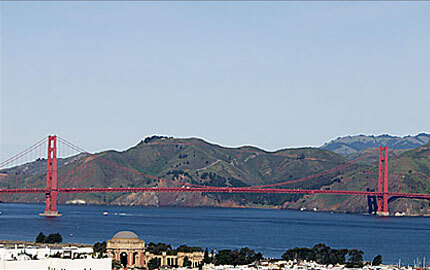 The spacious and beautifully proportioned room provides a gracious setting for entertaining with breathtaking views of the Golden Gate Bridge, bay and Alcatraz Island. Two softly arched recesses flank the ornate fireplace which has been imported from the British Isles and made of white statuary, yellow Italian and black Belgian marble in a matt finish. The squared bay provides intimate seating for private contemplation. The octagonal dining room is crowned by ceiling ornamentation in the Adam style with delicate, appliquéd plasterwork of pearls & shells surrounding a rosette of acanthus leaves. Built-in corner china cabinets provide a setting for fine display pieces and storage. The large window bay provides a space for breakfast or intimate dining with classic San Francisco post card views of the majestic bridge, passing ships and the shimmering bay. The water view can be enjoyed from the dream kitchen. When entertaining formally, the massive doors slide into the arched framework to close it off from the dining room for appropriate separation. 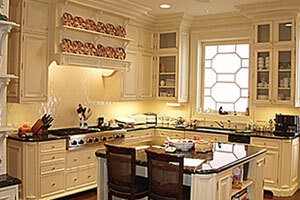 The kitchen provides a wonderful gathering place for informal entertaining. It is perfectly laid out and equipped with state-of-the-art appliances for gourmet cooking and catering. Countertops of banker’s green serpentine stone are from Vermont with Barbara Barry-designed ceramic backsplash. The work island has ample built-in custom storage, including double pull-up appliance drawers. The sunny west windows are beveled and frosted on both sides. The wet-bar area features glass front cabinets with ample storage for glassware; it is well located off the Great Hall to service both the library and living room. The very private MASTER BEDROOM is situated at the sunny southeast corner of the floor plan with sunny, verdant views of Lafayette Park and city skyline. A fireplace of black Belgian marble has been newly installed. THE DRESSING ROOM This unusually large walk-in space houses his and her closets lined in cypress and a large island storage system with marble top and custom drawers. The windows are lined with linen sheers and integral shutters block out light if desired. Three lanterns in the dressing room reflect progressively in the large mirror above the master vanity which has designer sinks and gold-plated Guerin fixtures. The Whirlpool tub has gold plated jets and hardware. The floor is heated for utmost comfort. Two sets of thick pocket doors separate the master bedroom, dressing room and bath for maximum privacy and quiet. A sliding arched door in the artfully integrated custom paneling of the Great Hall conceals the picture gallery to two sunny bedrooms both of which enjoy views of Lafayette Park. These rooms feature ample closets, custom baths with etched glass shower doors, Lalique hardware and bow-front vanities. Bath surrounds are of Jerusalem gold limestone. This cozy room is situated across the gallery, It is presently used as an OFFICE and has an adjoining quality marble BATH with etched glass shower. It may be used as guest or staff quarters. A closet houses the ‘mind’ of the apartment’s sophisticated heating control system of the building's steam system. Each room can be separately controlled by remote sensor. The main staircase in the GREAT ROOM leads to the upper level. 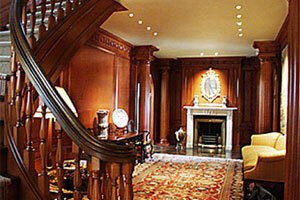 The cognac colored walls are curved to complement the lines of the stairs and the dramatic ceiling height. A faux painted barrel vaulted ceiling with up-lighting, tall windows and padded walls provide a dramatic effect in this wonderful at-home entertainment room. Custom built cabinets house a rear projection television & sound system. The two-tiered floor provides for comfortable viewing. Blackout window shades automatically lower when the media system is activated. A pool table with a classic hanging pool light fixturev is located at the north end of the room. A kitchenette with similar finishes of the main kitchen provides convenient food and drink preparation on the penthouse level. This light & bright room can house a full complement of at-home exercise equipment. Its tall windows provide city & park views and ample natural light. Quarterly Carrying Charges payable in three equal monthly installments of $2,847.84 or $8,528.52 per quarter (see annual budget). Taxes will be reassessed upon sale to approx. 1.129% of the purchase price. A list with description and prices of personal property is available on request from the Listing Agent. Prospective Buyers are advised to review prior to any offer the “Seller’s Disclosure Package” on file with the Listing Agent, including the Proprietary Lease, Bylaws, House Rules & Budget.